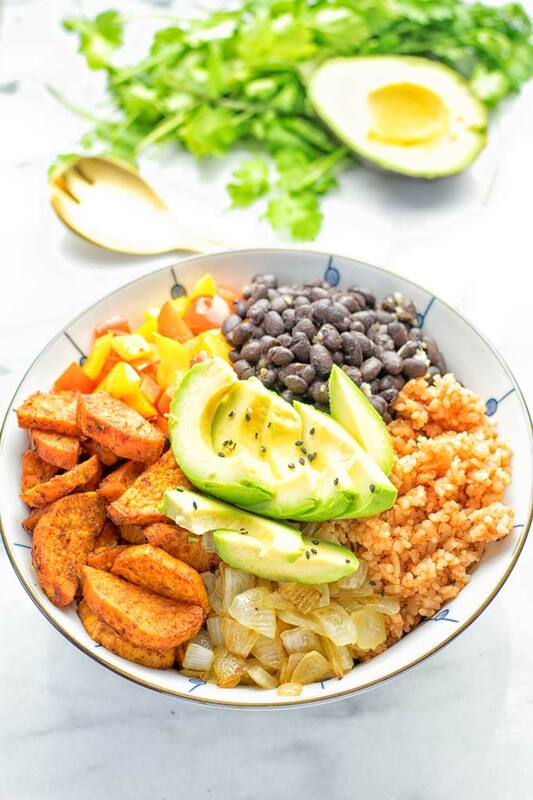 This Cajun Sweet Potato Rice Bowl is naturally vegan, gluten free and super easy to make. It’s full of fantastic flavors and delicious every time with add ons to your own liking. Bowl food was and it is any time a big part of my food rotation. 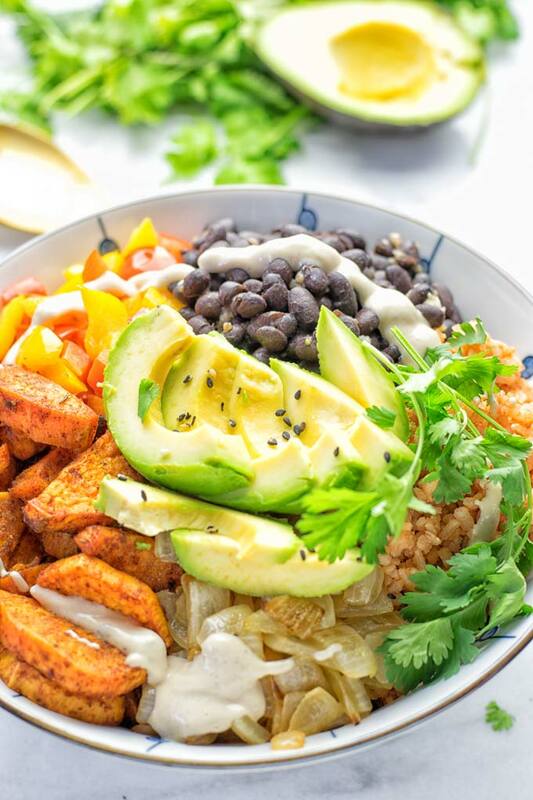 Just think about this Vegetarian BBQ Burrito Bowl or the Cauliflower Rice Buddha Bowl. 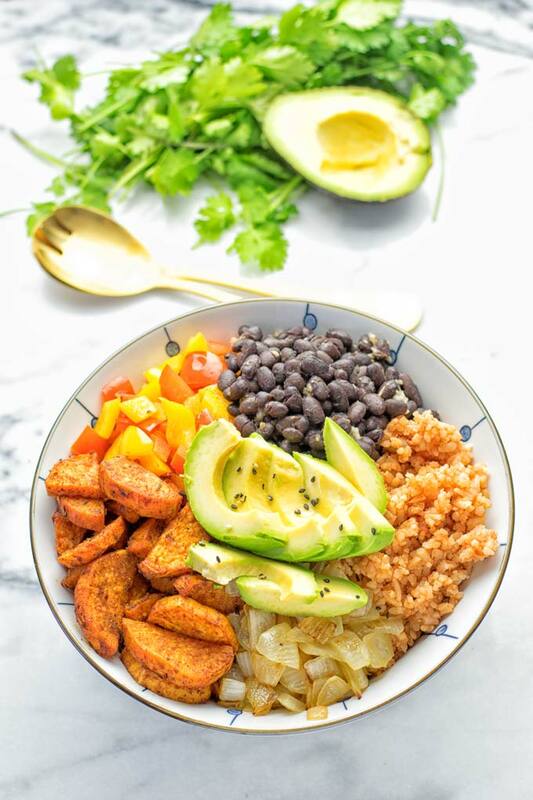 For more tasty bowl recipes, feel free to browse around. I love them because they are great for meal prep, work lunches, make ahead, or quick weeknight dinners. So much flavor, so satisfying. 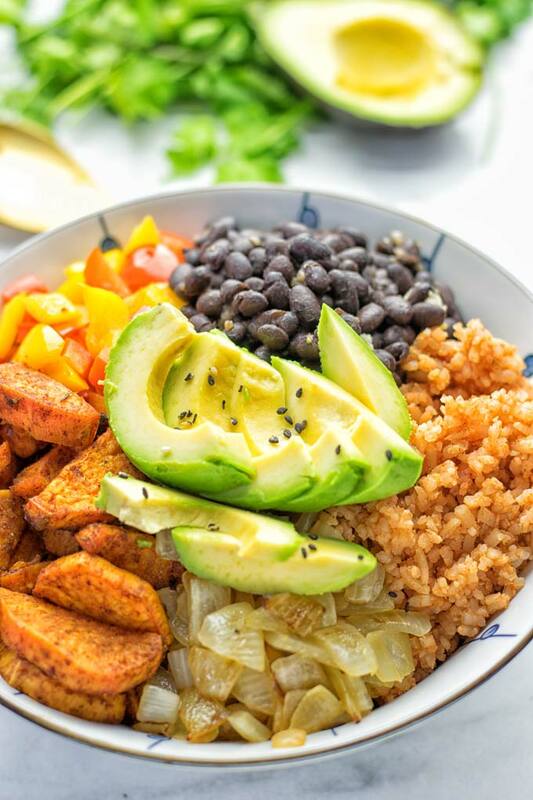 Flexible, easy as it gets, flavorful and tasty in the best way, hearty, filling, healthy, perfectly seasoned from the top to the bottom. Addictive, feeding your eyes – look at the beauty. It’s bowl food all around and seriously for everyone who gets into good and just mouthwatering food. You laugh, I’m with you. Cooking rice is not a big deal. It’s pretty easy. While there are differences in the manufacturer’s directions, there are a couple of small modifications you can try. Start with first rinsing your rice. To get the right texture of the rice after cooking depends on your tastes. You can use the double amount of water, which means 1 cup rice on 2 cups water, as general rule for a softer rice. Which is amazing from the texture for almost any dish. If you wish a more firmer style, reduce the amount of water. Take off 1/4 up to 1/2 cup. It all depends on your desired preferences. Note: Cooking time will definitely depend on the package directions and kind of rice. White rice needs different cooking times than long grain. Also black rice is different from the others. So please make sure to see and check the directions for accurate results. A rice bowl is a really flexible concept. You can add what you like, no matter what diet direction you follow. It’s up to you. The core is a base of rice, obviously. From there, you can add veggies, potatoes, pasta – anything you like. If you’re not a vegan, vegetarian, or dairy free you can add meat, fish, cheese, leftovers and top with any sauce you like. 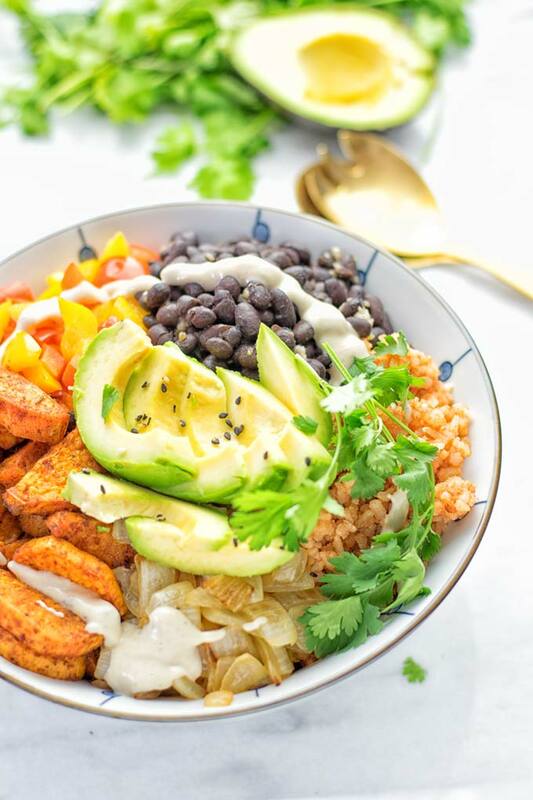 That’s how to make a rice bowl easy and efficiently without missing on aesthetic and flavor. Cook the rice according the directions and methods above. On a baking sheet prepared with parchment paper, mix the sweet potato cubes with olive oil, cajun seasoning. Season with salt and pepper. This way you save a bowl for mixing. Bake for around 20 minutes at 415°F. There’s absolutely no need to know more how to bake sweet potatoes, super easy right? 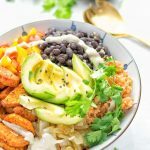 Now it’s time to get your hands on preparing the black beans from the Mexican Fiesta Cauliflower Rice. In a small skillet, heat oil, minced garlic, add optional onions and bell pepper. Finally, add drained canned black beans, set aside, and keep warm. 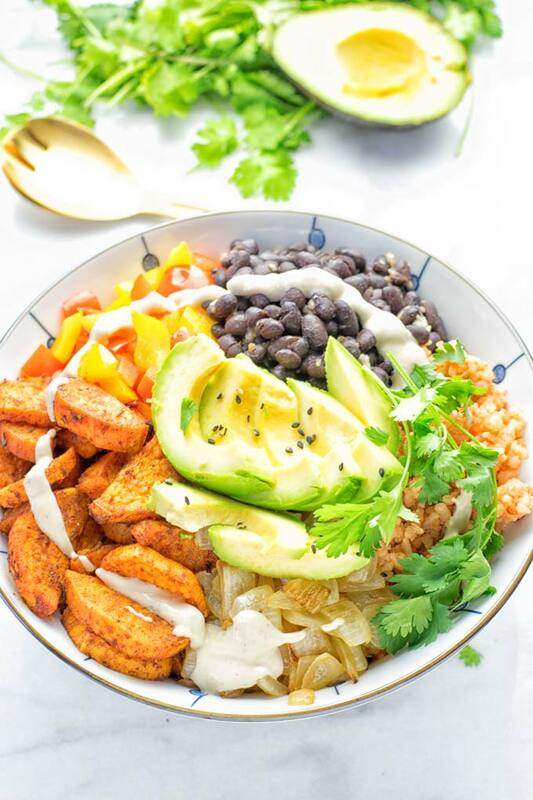 If you want use the optional tahini sauce in my Cajun Sweet Potato Rice Bowl, now it the time to make it. Mix tahini, lemon juice, garlic powder, and water in a small bowl. Whisk until creamy. Use less or more water for your desired texture. If you like a thicker sauce, use less, if you prefer it thinner use more water. 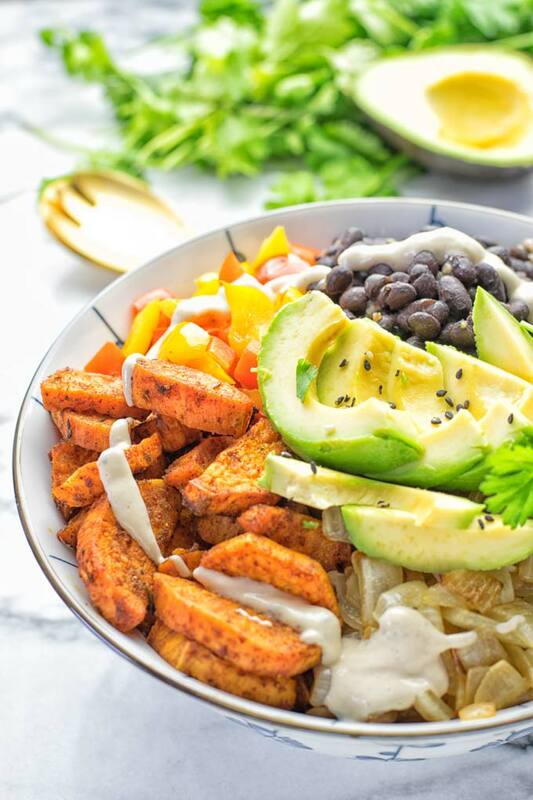 Start with rice, followed by sweet potatoes, beans, and optional avocado cubes, and a good amount of tahini and hot or BBQ sauce. This is an amazing dinner, lunch, meal prep. Also a great choice for quick weeknight family dinners. It’s an amazing spice mix often used in southwest dishes, which adds a lot of flavor. A mix of garlic, onion, salt, oregano, paprika. And for a bit more heat, you can add red pepper flakes or chili powder. I got mine at a local store, but if you can’t find a cajun seasoning, which has really the right amount of spice and heat, try making your own. Mix the above spices like garlic, chili powder, oregano, onion, salt, pepper and paprika together. Keep in mind use more chili powder for more heat and less, if you can’t have spices or are a bit sensitive to it. Start with only 1/4 tsp chili powder and go up from there to 1 tsp. You can add always more. For the other spices and herbs, I would say use 1 tsp oregano, 2 tsp onion, 3 tsp garlic, 1/2 tsp salt and pepper and 2 tsp paprika. 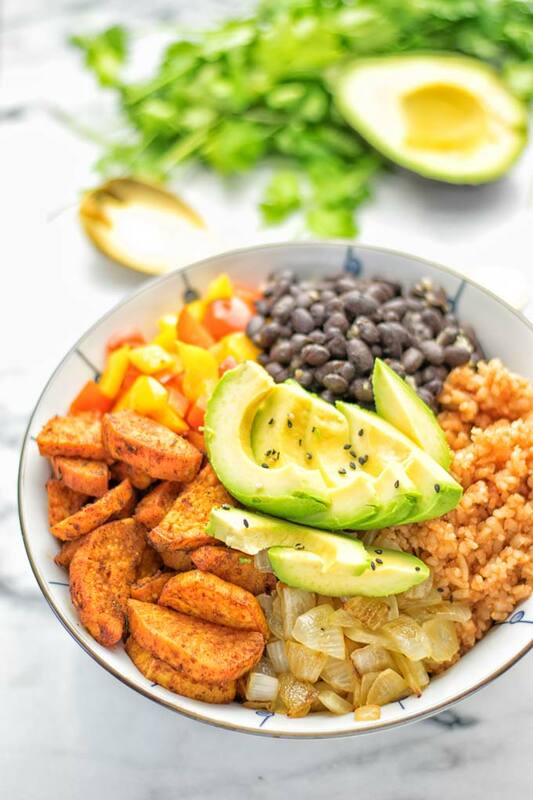 Let me know what you think about my Cajun Sweet Potato Rice Bowl. Share your feedback on Instagram and Facebook with a tag and picture. I can’t wait to see them all, Florian. Tahini Sauce for serving: 1/3 cup tahini, 1 tbs garlic powder, 1 lemon juiced, 1/8 cup or more water to thin. Cook the rice according the directions. On a baking sheet prepared with parchment paper, mix the sweet potato cubes with olive oil, cajun seasoning. Season with salt and pepper. Bake for around 20 minutes at 415°F. Preparing the black beans from the Mexican Fiesta Cauliflower Rice. In a small skillet, heat oil, minced garlic, add optional onions and bell pepper. Finally, add drained canned black beans, set aside, and keep warm. Assemble the bowl. 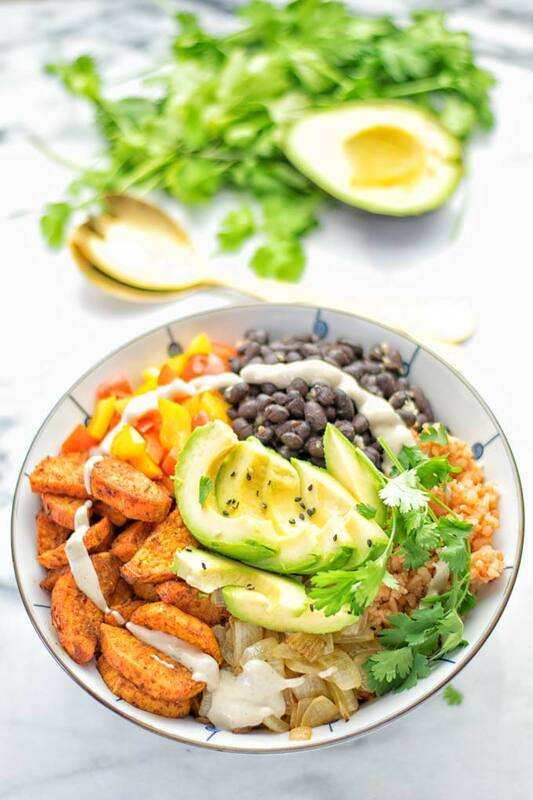 Start with rice, followed by sweet potatoes, beans, and optional avocado cubes, and a good amount of tahini and hot or BBQ sauce.